Click on the picture, then use the zoom tools on the right. Scroll down and click on "More images", then click on a picture to see a larger version. Scroll down and click on "Images" to see the boots, then for the podcast, click on "Multimedia" then the play button. Click on "See works of art" to begin. Click on "Filter by" and select "1970-1979", then click on a picture to see a bigger version. This video clip is from "CHiPs" - a 1970s TV show. This clip is from the 1970s film, "Saturday Night Fever". Video may not work where you are due to copyright restrictions. 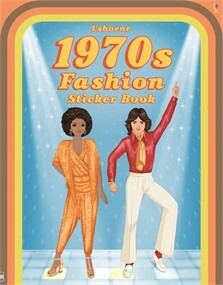 Freak out the children by showing them what we used to look like, with this brilliant collection of stickers and styles from the 70s.